One year after the opening of the hypercoaster KÄRNAN, Hansa-Park completes its rollercoaster line-up with a new ride. „Der kleine Zar“ (The little Czar) provides a great start to the adventure of roller coaster riding for all the younger guests. True to the motto “My first rollercoaster”, „Der kleine Zar“ is theming wise orientated on the very first rollercoasters, which were called “Russian Mountains”. 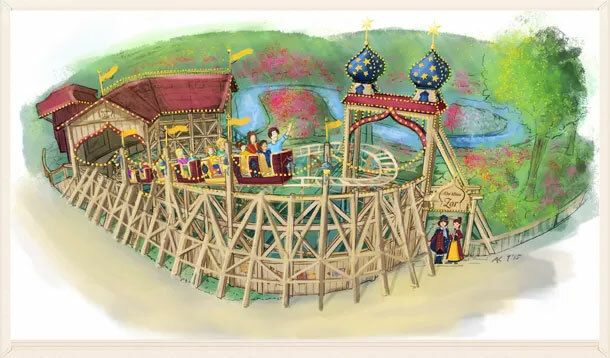 That’s also why the ride will be placed close to „Fluch von Novgorod”, another rollercoaster of the park, which in its story takes its riders to mystical Russia. IMAscore produces the soundtrack for „Der kleine Zar“, interacting with the lovely written tale, which will be available on CD when the ride opens later this year. The CD works best when played as a bedtime story just before the little ones go to sleep.